and very complex to use. Wouldn’t it be nice if you could re-arrange these sections to a way that helps improve your UI experience? This plugin comes with very nice solution for this whole. While editing a post in WordPress there is a category/taxonomy metabox that shows the categories/terms in tree/hierarchy. 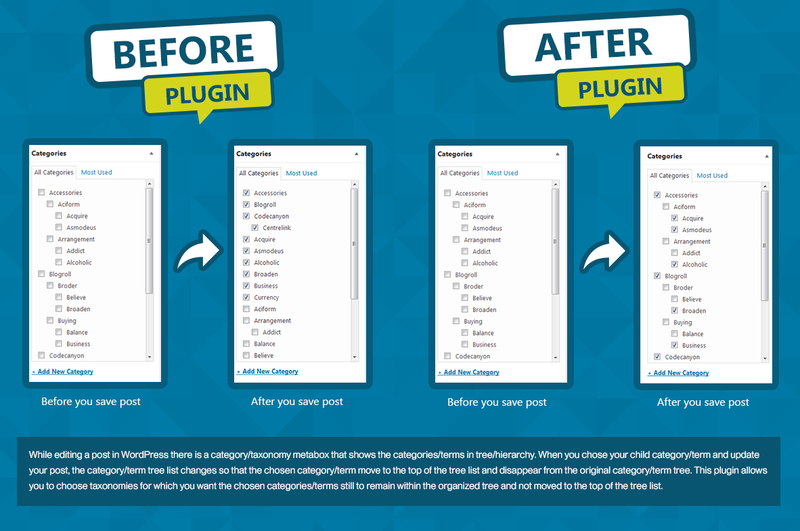 When you chose your child category/term and update your post, the category/term tree list changes so that the chosen category/term move to the top of the tree list and disappear from the original category/term tree. This plugin allows you to choose taxonomies for which you want the chosen categories/terms still to remain within the organized tree and not moved to the top of the tree list. You may often notice that there is a category/taxonomy metabox on the post edit screen that is very complex to use. Wouldn’t it be nice if you could re-arrange this metabox to the way that helps improve your UI experience? 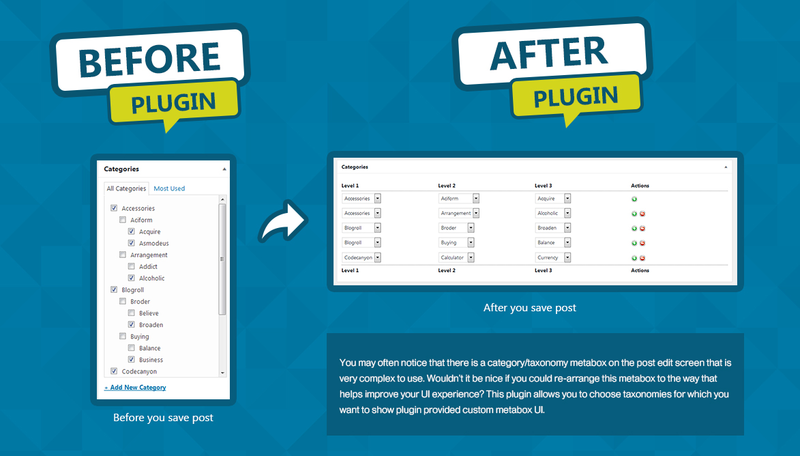 This plugin allows you to choose taxonomies for which you want to show plugin provided custom metabox UI. After using WordPress for a while, you may notice that category/terms listing page is very complex to use as it mixes up parent and child terms on the same page. Wouldn’t it be nice if parent and child terms can be differentiate in a way so it shows only parent terms with having a quick link against each term to see its child terms? This plugin allows you to choose taxonomies for which you want to show plugin provided custom listing UI. While editing a post in WordPress there is a category/taxonomy metabox that shows the categories/terms in tree/hierarchy. See the order of terms. 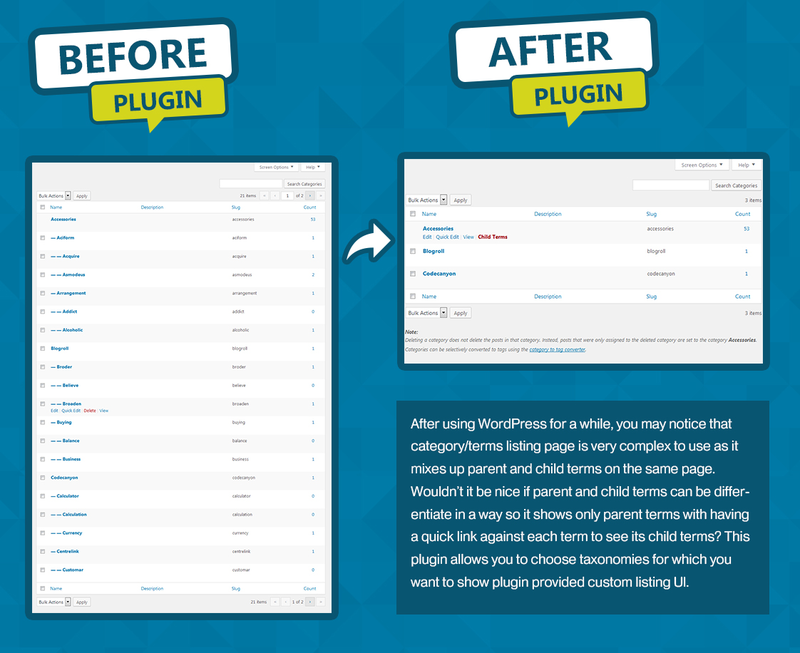 Aciform is a child term of Accessories and its very clear with WordPress default meta box. Same way Acquire and Asnodeus are further child terms for Aciform. Now you chose your child category/term and update your post, the category/term tree list changes so that the chosen category/term move to the top of the tree list and disappear from the original category/term tree. You can see Aciform is not after Accessories and seems as a parent term on the bottom. Activate this setting and refresh same screen. This time you can see correct order of terms eg: Aciform after Accessories and Acquire after Aciform. While editing a post in WordPress there is a category/taxonomy metabox, you may often notice that there is a category/taxonomy metabox on the post edit screen that is very complex to use. Hows if you could re-arrange this metabox to the way that helps improve your UI experience? Activate this setting and you can feel a new UI experience with terms metabox. After using WordPress for a while, you may notice that category/terms listing page is very complex to use as it mixes up parent and child terms on the same page. Hows if parent and child terms can be differentiate in a way so it shows only parent terms with having a quick link against each term to see its child terms? Activate this setting and you can feel a new UI experience with terms metabox. 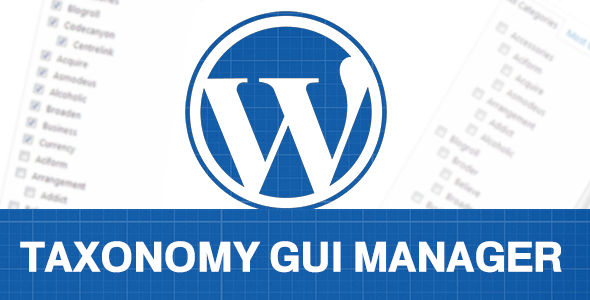 Upload the `wp-taxonomy-gui-manager` folder to the `/wp-content/plugins/` directory. Visit the “WP Taxonomy GUI Manager” Sub Menu from “Settings” Menu.